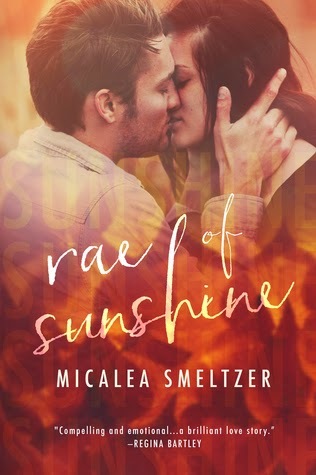 I have loved every book that I have read by Micalea Smetzer. Maybe it’s because she writes her books in a way that makes you feel right along with the characters. Or that she creates these beautiful, amazing and swoon worthy heros that you completely fall in love with. And in Ree of Sunshine, Cade was that hero. This story is one one that I think may hit close to home for some. It deals with some issues that I think people can understand and relate to. I found myself questioning my own actions and thinking twice about what I do. It is a beautiful story and one that I loved. Rachael had made one decision in her life that cost her so much. She lost her boyfriend and her two best friends because of one stupid decision. One that she will never forget or forgive herself for. It has been over a year since the tragic accident and Rachael is on her way to college. She is no longer Rachael, that girl dies along with her friends that night. She now goes by Rae, who is no longer the fun and outgoing person that she used to be. She wants to go away to college and just be on her own. She doesn’t need to make friends with anyone and she certainly does not need to fall in love. She doesn’t think that she deserves to be happy after what she did. But meeting her room mate and literally bumping into one of the most gorgeous men that she has ever seen will soon change that. Cade is the big football payer on campus. He is the star of the college team and on his way to the NFL, which means that he is that guy that everyone wants to know. Guys want to be friends with him, girls want to date him and teachers and coaches expect a lot of him. But Cade is not that guy who likes to be the center of attention. He loves to play football as a sport but he does not enjoy all the attention that comes along with it. He isn’t the typical jock who is with a different girl each night, just because he can be. He is so different than the person that you would except him to be. Can he be a bit cocky at times? Absolutely. But when you get to know the real Cade you see how damaged and broken he is. But admitting to his father that he does not want to play in the NFL and would rather follow his own dreams isn’t something that Cade can do. One day he literally bumps into Rae and right there he knows that there is something special about her. He knows that she is unlike most of the girls that he meets. She doesn’t want to be near him because of who he is, she certainly doesn’t want to date him or even be his friend for that matter. But he wants to be friends with her and get to know her and is relentless in his pursuit of her. I think that he wants to be more than friends but can see that she has walls up that will be hard to break down. So taking things one step at a time is what he needs to do. Rae needs to be able to let him in, to trust him, to be his friend before anything else. But first she needs to forgive herself for her past mistakes. Rae’s roommate also happens to be Cade’s younger sister. She is just as determined to be friends with Rae. Thea and Cade are very close and that has to do with their past and their childhood. Cade looks out for his sister and will do anything to protect her. Thea sees the connection between her brother and Rae and she has never seen her brother this happy and this open with someone. She is their biggest supporter. Cade is determined to break down the walls that Rae has put up. He knows that there is hurt in her eyes and that she has a hard time opening up but he wants to get to know the real Rae. Cade is in a word amazing. He is sweet, caring, kind, adorable and just perfect. I love the relationship that he has with his sister and how protective he is of her. Rae has become a different person since that night but Cade and Thea start to bring out the old Rachael little by little. They make her see that she deserves to be happy. That just because she moves on it does not mean that she has forgotten. Rae and Cade are both broken in their own way but together they both learn to heal. As always Micalea as written two characters that I just loved. They are two characters that you can relate to and want to be friends with. This is a wonderfully written story about love and loss. There is a part of me that wished we did get more of Cade’s story with his family but I know that this was Rae’s story. It is the story about a girl who is trying to move on from a tragic accident. She has let the guilt that she has carried around consume her to the point that she does not think she deserves to be happy and to move on with her life. We see how she learns to heal and come to terms with what happened that night. There is a very important and powerful message in her story but this is also a story about love and friendship. Cade and Thea came into Rae’s life at a point where she needed them the most. Cade and Rae are two broken people who learn to heal together and to find the happiness that they both deserve. Another fantastic job by Ms. Smetzler.